These zebrafish larvae are five days old. And that can help real patients. Sometimes, the cause of a tumor is a typo in one or more genes. To understand that error better, the same mutation can be edited into zebrafish, and the fish can be examined for similar symptoms. That, perhaps, is the most valuable thing about zebrafish as a model: They can be genetically manipulated. Biochemical researcher Shizhen Zhu, M.D., Ph.D., and her team engineered multiple lines of zebrafish to make it faster and easier to study neuroblastoma — the deadliest childhood cancer in the United States. High-risk neuroblastoma often starts before birth, with symptoms appearing in infancy. It is rarely found in children older than 10. This cancer occurs when gene defects force fetal nerve cells (neuroblasts) to divide uncontrollably, forming tumors instead of becoming functional nerve cells. Some neuroblastomas grow and spread quickly, but others grow slowly and sometimes in very young children, the tumors even go away on their own. Image of a two month old zebrafish expressing a red colored tumor. Genomic analyses have identified an assortment of genes related to neuroblastoma susceptibility, including one called MYCN. Several years ago, Dr. Zhu and her colleagues engineered zebrafish that make high levels of MYCN. About 25 percent of the offspring from this line develop tumors. Next were zebrafish that overexpressed not only MYCN, but also a gene called ALK. About 70 percent of the offspring from this line developed tumors that grew to closely resemble human neuroblastomas. Most recently, her zebrafish lines have clarified the relationship between MYCN and a gene called LMO1, which fuels the aggressive spread of neuroblastomas. A new line expressing the metastasis-causing form of LMO1 was crossed with a line overexpressing MYCN, resulting in eighty percent of the offspring developing neuroblastomas that metastasized. This is a promising result according to Dr. Zhu, because metastases, rather than primary tumors, are responsible for most deaths. Dr. Zhu’s goal is to translate her findings into effective therapies for children. Her engineered lines “provide a valuable platform for evaluating the effect of drugs on neuroblastoma,” creating targeted therapies to kill existing cancer cells and to still the metabolic pathways stirred up by susceptibility genes — so the cancer doesn’t come back. When researchers talk about genome editing, they’re often referring to rewriting the DNA in cell nuclei. But the cell’s mitochondria—where energy for the cell is generated—contain their own tiny genomes. And errors in mitochondrial genes negatively affect almost 1 out of every 2,500 people born in the U.S. each year. Starting from scratch, one of Dr. Ekker’s research teams is using zebrafish small fry to develop tools to edit the mitochondrial genome. Moreover, as part of Dr. Ekker’s wider interest in modeling rare diseases, he has a different team looking directly at how mitochondria affect disease. They are, for example, using zebrafish to model the French Canadian form of Leigh syndrome — a rare, fatal, inherited disorder that affects the central nervous system, beginning in early childhood. Zebrafish larvae engineered to have the inborn error for Leigh syndrome have much the same symptoms as human children. Their kidneys and hearts are close to normal. Their connective tissue and muscles are only somewhat affected. And their livers and brains are profoundly affected. When Dr. Ekker corrects the DNA error in the livers of the sick larvae, their liver function improves, but so does their neurological function. This may have positive implications for regenerative medicine, where a patient’s own cells can be harvested, tweaked and used as therapies. 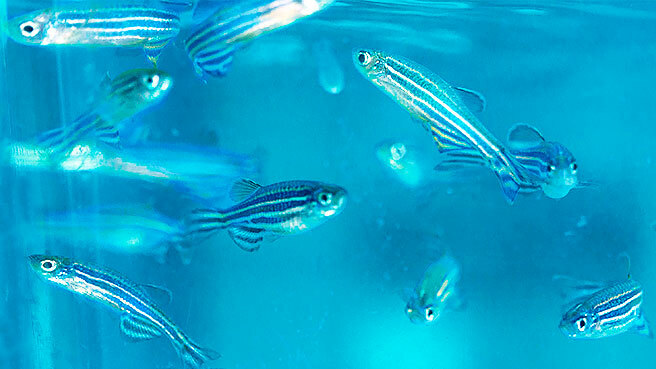 In addition to mitochondrial disease and cancer, zebrafish can also help with hearing loss. More than 70 percent of human genes have orthologs (genes in different species that evolved from a common ancestral gene) in zebrafish. Genetic variants that make people deaf make zebrafish deaf, too. Lisa Schimmenti, M.D., Professor of Pediatrics at the Mayo Clinic and a longtime collaborator with Dr. Ekker, cares for children who have rare diseases associated with hearing loss. She uses zebrafish to model the conditions she encounters in the clinic. “I feel like a kid in a candy shop with all the cool genomics tools I have access to,” Dr. Schimmenti says. With some types of hearing loss, parts of the inner ear and brain that process sensory information are involved. In response, fish exhibit behaviors that parallel those of people. Currently, the only treatment options for patients with hearing loss are devices like hearing aids and cochlear implants. But Dr. Schimmenti believes that drugs could be found to bypass at least some of the genetic defects that cause deafness. Her team is screening candidate compounds by putting them directly in the water and monitoring the fish for changes in their responses to sound. Voila. The utility of zebrafish. Drug evaluation may also help with hearing loss that isn’t genetic. Cancer treatments save lives but their side-effects may damage the nerves or structures associated with hearing. To prevent or detect hearing loss early when it can perhaps be reversed, Drs. Schimmenti and Ekker are building on zebrafish work done in collaboration with Shawn Burgess, Ph.D., at the National Human Genome Research Institute in Bethesda, Maryland. The fluorescent green ridge in the center of the image shows part of the zebrafish’s ear cells called the stereocilia. These stereocilia sit atop the hair cells and bend in respond to sound. The red denotes two proteins (either neo1, csk or both), blue is cell nuclei. Zebrafish hair cells work like human hair cells. Through zebrafish researchers are able to study how changes in genes change zebrafish hearing and hair cell structure. They hope to evaluate drugs that could safeguard hearing during cancer treatment, and they’ve developed an iPad-based hearing test to allow patients to test their hearing thresholds anywhere. This is valuable, says Dr. Schimmenti, because further hearing loss can sometimes be prevented if detected early. This test is currently being validated. From hearing to mitochondria to cancer, these silver and blue fish, decorated with glittery bands of scales, can help with an astonishing range of research questions. And the translation of that research into new diagnostic tools, medicines and treatments will be the biggest catch for patients with unmet medical needs.